Locally grown food has gained popularity because of its environmental and individual benefits. 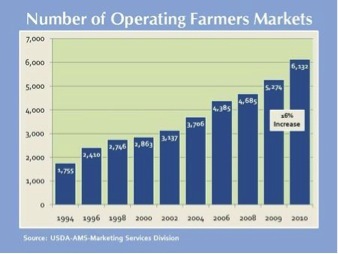 The USDA Farmers Market Directory reported 7,175 farmers markets in the United States in 2011 (Milteer, 2012). There are many up-and-coming technologies that are allowing cities such as Chicago and Schaumburg to have readily accessible local food. Vertical farming, hoop houses, and green houses are some of the technologies that are being used in order to maximize the months in which locally grown food is available. Big chain restaurants such as Chipotle and Big Bowl market their locally-bought products to attract local food consumers. Studies have shown that people are willing to pay premium prices for sustainable local produce. Farmers and restaurants are not the only people benefiting from this popularity; the decrease in transportation as well as in the use of preservatives and pesticides all reap environmental benefits. The first question many people have when beginning the process of buying locally is, what is considered locally grown food? Locally grown food means different things to different people. There is no set definition that all communities or farmers markets abide by, but having knowledge of who your local farmers are will give you an idea of how local your diet can be. Jessica Prentice (2005) coined the term locavore at the San Francisco Bay Area World Environment Day in 2005; she defines this as a way to promote the practice of eating a diet consisting of food harvested from within an area most commonly bound by a 100 mile radius. This definition is not feasible for the average American, especially the average Illinois resident. Illinois has long winters and short summers that make it very difficult for markets to offer locally grown food that fits into Prentice’s definition of local. Eating locally in Illinois, consequently, should be considered from within a 300 mile radius. Illinois has many surrounding states that can offer great produce from spring through the end of fall. During winter months eating organic produce in the U.S season would be best. There is only one farmers market in Schaumburg, Illinois; however there are many more in the surrounding towns and cities. Schaumburg’s farmers market offers a great variety of fruits and vegetables grown locally and sustainably. The market runs from Friday June 8th through October 26th, 7 am to 1 pm, at the Trickster Gallery 190 south Roselle Road. This market also offers locally made cheese, pastries, spices, and seasonal plants. Chicago itself has over 25 markets excluding the downtown region. More impressively, there are over 100 CSAs (Community Supported Agriculture) that work with residents in Schaumburg (Schaumburg community supported agriculture). CSAs are joint ventures between a farm and a group of supporters who purchase a share of the season’s harvest. Supporters pay a fee before the season and in return receive their share of produce that is grown throughout the season. The money helps the farmers pay for the cost for seed, fertilizer, and water and equipment maintenance. CSAs provide several advantages for both the farmers and the supporters. The farmers are able to budget themselves ahead of time because they receive money before the season and they are also able to market a wider variety of fruits and vegetables. The supporter is able to enjoy fresh produce that has great flavors and are high in vitamins all season. In addition the supporters care able to take their children for an educational visit to the farm that produces their annual produce. Local farmers markets such as Schaumburg’s increases neighboring business (Conner, 2009). Farmers markets not only support local farms that are owned by neighboring residents, but bring in tourists from surrounding towns who will then shop at other local businesses. Time Magazine reported in 2009 that buying local increases the “velocity” of money circulating locally. The farmers and suppliers reinvest in the community by paying for advertising, hiring local workers the paying for the up keeping of their farm (Schwartz, 2009). Small farmers also buy their seed from local vendors as opposed to large farms who for the most part buy in bulk from distant companies (Herriges, 2003). The Economic Research Service reported that local farmers on average employ 13 fulltime workers per $1 million in revenue which produces about a total of 61,000 jobs in 2008. Large corporate farms that produce fruit and vegetables, by contrast, employ about 3 full-time workers per $1 million in revenue (Milteer, 2012). Shopping from local farms decreases the environmental impacts caused by conventional farming. A high percentage of local farmers practice sustainable farming. The largest use of fossil fuels for food is not transportation. 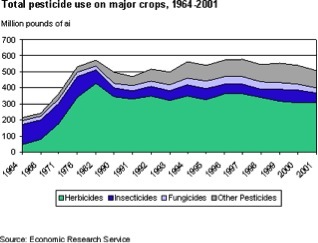 Heller (2000) found that pesticide production accounts for forty percent of the use of energy in food production. When food has to travel far, big food producers are forced to use large amounts of plastic and paper to help preserve the produce for long distance travel (Heller, 2000). The combination of plastic, paper and fuel use alone puts a great stress on the environment. Buying locally grown food decreases the amount of fuel used to transport the food and minimizes the need for the use of plastic and paper to help preserve it for the transport. Pesticides are the greatest concern of people when buying local. Pesticides are used heavily to produce food in massive quantities and to preserve food items in transport. Pesticides have many negative health effects, as they have been linked to cancers and birth defects (Pesticide Action Network, 2004). Sustainable farms practice methods either completely avoiding pesticide use or use pesticides minimally. Farmers markets allow the consumer to speak with the owner/farmer directly about their practices. A consumer should ask what type of chemicals if any on used on the produce and what type of seeds are used. One common method use is IPM (integrated pest management), in which farms will grow pest-resistant crop varieties, and use predatory insects to kill plant-eating pests, employ mechanical pest traps, and eliminate nesting areas by plowing under harvested crops (Worosz & Harris, 1996). Shopping local has many benefits for the environment, the community and personal health. Schaumburg has many resources to offer to its residents. Checking out the local farmers market is the first step to getting to know your local farmers and suppliers. The popularity of locally grown food will only gain popularity with great resources such as the markets and the CSA options offered in edge cities like Schaumburg as well as big cities like Chicago.